Japanese tech company Suidobashi Heavy Industry has released the KURATAS robotic suit making us all one step closer to Gundam-style technology. 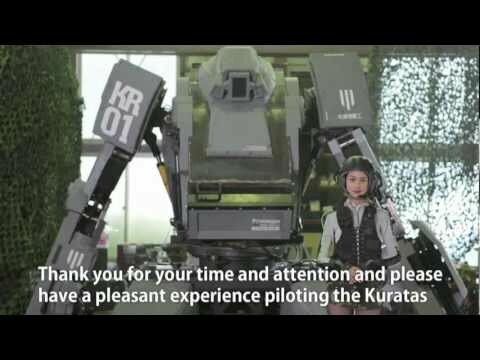 KURATAS is the first giant boarding-robot, which is about four meters height (about 13 feet tall). Piloted by humans, it’s got the most advanced control system with the AE “V-Sido”. Not only can you operating KURATAS in the cockpit, but you can also enable controls and interaction with Kinect. You can operate it easily without taking a professional training such as a combat plane. Additionally, you can control KURATAS via the mobile 3G Internet access. Personalization and customization is available for your unit. Whether it’s holding a squirt gun like fire fighter, painting a body camouflage like ranger in jungle, giving a mop and a cleaner like home cleaning robot, it’s really up to you. KURATAS can also be armed with a multi-rocket launcher that fires plastic rockets filled with compressed water or two Gattling cannons that can shoot a about 6,000 plastic BBs per minute when you smile. Rumored price tag is $1.3 million. This entry was posted in technology on July 31, 2012 by Kevin Hsieh - channel APA. Rapper AM Kidd released his music video for his single “Ultraviolet”. In his music video, he utilizes blacklight to illustrate his ultraviolet vision of his girl. Her beauty and time with him is unparalleled. The song gives you a new look on love. Listen to more AM Kidd: Deserve The Realest, Unspoken Feelings, Never Getting Married, Ready for Me, Free The Past, Today, Better Than You, and Baddest Love. Soon as she calls, I’m with it. This entry was posted in music on July 31, 2012 by Kevin Hsieh - channel APA. 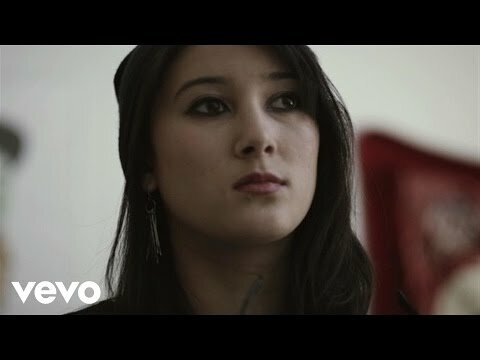 Sister of singer Hollis Wong-wear of Canary Sing is part of a new group “The Flavr Blue.” The first single from the group is “F x F” on their debut album “Pisces.” The music video for “F X F” traces the irreverence and revenge of a girl’s night out. Destructive female forces in action. In the video, a trio of women destroys an exes apartment and trashes his most valued possessions. Don’t get on the wrong side of this girl. You can get the track on or amazon. Part Filipino R&B/POP/HipHop artist M.i.C released the music video “TakeOff”. The member of the group N3W ERA is moving down the solo route trying to get things soaring for his music career. He’s on the grind trying to sell out shows and make some dough. While watching others succeeding in music, M.i.C. aims to follow them and carve out a piece of the pie himself. No stopping til he gets there. He’s boarding his plane now as he takes flight. Listen to more flight inspired songs: Boeing Jets, Like a G6, Wings Up, First Flight, and Paper Planes. Rapper Young Chariz joins singer Alex Carbonel for the music video “The Break Up”. In the video, follow the ups and downs of their relationship. From having fun when they first meet to fighting with each other two years later, the couple gradually grows apart. While Young Chariz wants to work things out, Alex doesn’t want anything to do with him. Will they be able to save their relationship or will it fall apart completely? You can download the single FREE here. Listen to more Young Chariz music: Dead End Job, The Final Curtain, The Next Level, No Talkin’, The Way She Moves, Do The Damn Thang, and iGoRilla. In the Powerhouse episode “Summer Olympics”, Rick educates Tim and Pedro about the Olympics. With the potential of fame and glory, Tim and Pedro decide to use their superpowers to compete in the Olympic games. Training at their home for these two don’t go quite well. However, can these guys still make the Olympic team with their special powers? 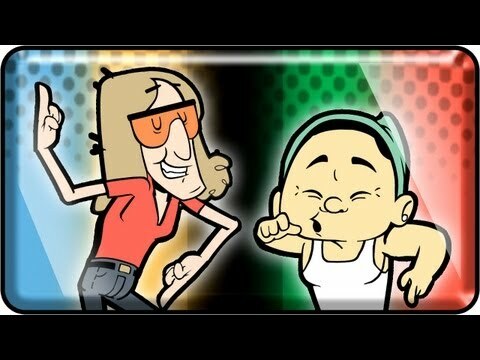 This entry was posted in animation, comedy, shorts on July 31, 2012 by Kevin Hsieh - channel APA.